A Bag of Warm, Viscous Fluid in A Cheep Plastic Microwave, Day ’98 in The Year of Fun. 1. ‘Sploytation Day. Pick a Trope and ‘Sploytate. 2. Soup Flavored Ice Cream for True Ice Cream Soup. 2. Live As If This Is The Past’s Version of Today. 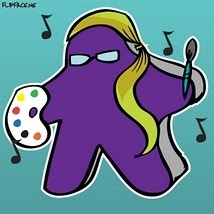 Pop Culture Today: This Weekend is Tabletop Day. Play board games and enjoy, ya nerd. Visit links for info and free games. The free Little Fears makes the free bundle a great deal. I like so-called Ameritrash games better than European strategy games. There, I said it. Essen is coming up and all of the gaming blogs are gearing up for the latest worker placement game or auction game or game that recreates building a 17th century citadel or whatnot. But I’m most excited about the latest Fantasy Flight opus Mansion of Madness, a goober filled box of theme, mystery and asymmetrical play. Loves me the Lovecraft board games. And Fantasy Flight is one of the top Ameritrash game makers. So, what is an Ameritrash game? While the name sounds negative, i don’t see it that way. I’ve never read a formal explanation, but in my mind, an Ameritrash game is one that emphasizes theme over mechanics. It’s a game with a lot of bits and flavor text and atmosphere. This usually means a certain amount of luck has to be factored in and the winner may not necessarily be the ‘best’ player. Good Ameritrash games tell a story, set a scene. Power gamers tend not to be Ameritrash fans, as the advantages aren’t as easily quantified compared to the more abstract, mechanics-based games. The playing of the game is more fun than the winning of the game. We have a few more European style games and the ones I like the most, like Agricola and Fresco, have a pretty strong theme. The ones I dislike, mostly Renier Kniza games (I mean, I should like a game called Zombiegeddon, right? ), the theme is just an afterthought. Cool mechanics are not enough. Flying Frog is a relatively new game maker, but they’ve come out swinging like the big boys with two solid games, Last Night on Earth and Touch of Evil. Invasion From Outer Space, The Martian Game is a fast-paced game of fiendish Martians, Big Top Heroes, and SciFi Movie Action. Players take on the role of either the Carnival Heroes, using their special talents and working together to fight off the Martian Invasion; or as the invaders themselves, waves of Martian Soldiers and Flying Saucers, blasting Humans with Ray Guns and unleashing their vile alien technologies upon the Earth. 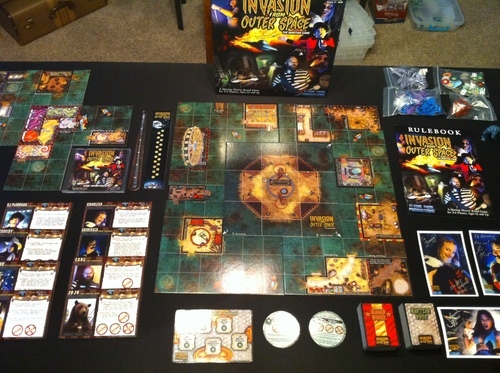 Featuring a modular game board, eight Carnival Heroes to choose from (such as the Fire Breather, Strongman, or Jo Jo, the dancing Bear), an army of Martians to start the invasion (including Martian Champions such as the dreaded Zard Beast), and several different Scenarios to play that drastically change the game; Invasion From Outer Space is designed to create a cinematic feel as the story and game unfolds. Also, as Invasion From Outer Space is built using the Last Night on Earth game engine, the two games are fully compatible. With ease, players can now have their Martians invade the small town of Woodinvale, Zombies attack the Carnival, or even play a massive game with up to three independent factions (Heroes, Zombies, and Martians). The possibilities are endless. The game uses the Last Night on Earth engine and can be played alone or combined with LNoE for Martians versus Zombie fun. We have LNoE and all of the supplements and Invasion fits in nicely, both from a graphic and gameplay stand point. I’m a fan of Flying Frog’s photographic style of character boards and cards. Hey, you can even be a bear against the Martians. If you’ve played LNoE, you’ll pick up Invasion quickly. The rules of conflict are pretty simple die rolls with lots of modifiers. The Martians are easier to kill than the zombies, but can shoot Ray Guns and deploy bigger Martian creatures and tech. So, the longer they’re in the game, the more powerful they are. This is not a symmetrical game, the Martian player will win more than the humans. It’s a fact. I played twice as Martians and won both times, although the humans did get close. Unfortunately, both games came down to a few bad (or in the case of the Martian player, good) die rolls. You really can be ruined with a handful of bad die rolls. So goes the invasion. The game isn’t a simple war game, but built on scenarios. You have a certain number of turns to finish a goal. Mostly, the humans have to stop the Martians from accomplishing some goal. Outlasting the Martians does seem the best way for the humans to win. The human player is individually stronger with many more options per turn, but the Martians overwhelm with pure brute numbers. In keeping with Flying Frog tradition, Invasion also comes with a music CD to play in the back ground to help set the mood. It’s pretty simplistic carnival/space music and OK, but not as good as the precious game CD’s. But no deal breaker. Also,in Flying Frog tradition, new scenarios should be showing up on the website for free. A suggestion for future expansions, make an expansion that further joins Invasion to LNoE, much like Steve Jackson’s Munchkin’s Blender sets. Also, more humans, the first batch of eight humans seems pretty close to some of the humans in LNoE, at least in abilities. Some kind of long distant sharp shooter would be awesome. So, if you own Last Night on Earth and even like it a little bit, you should buy Invasion. If you’re looking for a fun beer and pretzels game and are attracted to the Mars Attacks! Theme, check out Invasion. The bits are nice, the theme is solid and the Ameritrash is strong. The other day when I went into my Friendly Local Neighborhood Game Store, one of the owners asked me how I liked my iPad. I had shown him Small World on the iPad a few weeks ago and he seemed impressed. The other hangers-on in the store, the group of guys who always seem to be there had bad-mouthed me about my Mac toy a while ago. No bother, a lot of irrational Mac haters still live in 1996. Fortunately, the genial owner saw the benefit of the iPad for RPG’s and as translations for board games and would ask me about it when the others were gone. I think the iPad is such a great boon to board games and paper RPG’s, Shells almost convinced me to run a panel at the upcoming NukeCon in Omaha. I got lazy, but I do plan on holding a few impromptu panels or at least meet up with other iPad fanatics. I said to the FLNGS (I think I got the letters wrong) guy that Neuroshima Hex was coming out soon for the iPhone and iPad. And he said, in words guaranteed to turn Shells off, “Oh, I call that Magic the Gathering the Board Game.” Shells isn’t a fan of Magic because of the time-consuming deck building aspect of most CCG’s. Oh great, I thought, the one person I’ll play the most games with will hate it. When I saw the original 2006 Neuroshima Hex board game in the stores a few years ago, it looked like a 70 dollar monstrosity. A million pieces, strange weird symbols and something that looked needlessly complex. Even discounted to 30 bucks, I was hesitant. When I heard about it for the iPad, I was actually excited. This is why I have an iPad—to take something with a jillion pieces, lots of moving parts rules wise and have the iPad do all the mathematical heavy-lifting. And for four bucks, I’m sold. After playing roughly five 15 minute games in the last day, I can say while I’m not a master and while I may not even understand the rules and strategies very well, I am hooked. And it isn’t Magic the Gathering the Board Game. It’s a light war-game in the vein of a Battlelore. (I will buy Battlelore if it ever comes out for iPad and I will also buy every expansion. Get on it Days of Wonder or whoever now owns Battlelore!) I think the iPad is perfect for light to medium war-games and miniatures games. I also plan to eventually pick up Ex-Illis which looks to combine the real world tactical miniature genre with an iPhone to do all the math. Okay the rules as I understand them. (BTW, the game does have the full rules built in with a tutorial and breakdown of every unit in the game, very helpful as I learn) 2-4 players play one of 4 factions battling to destroy the other players headquarters, a sort of health meter in building form. Each faction has their own focus, a la Magic, and has their own special units. I haven’t played enough to see if I have a favorite or if one is more overpowered than the others. Each turn you draw three tiles out of your set of 35 tiles. There are three types of tiles—units, special buildings and instant actions. The units are the fighters trying to take out other units and destroy the headquarters. The special buildings give bonuses to the units adjacent to them and the instant actions let you do a one time action like move a unit or start a battle. The battles are a multi-layered affair happening both simultaneously and in phases. It’s like the speed attribute in CCG’s. I like it because it makes the game very strategic. You gotta think out whether or not you want to battle. And like many computer real time strategy games, the units can only fight in one or two of the six directions of the hex. Some units can rotate and move, some can’t. For every ability that a unit can’t do, there’s usually a special action tile or building to add that function. There’s also ranged and melée attacks and lots of other little goodies.the board game also has a few expansions, so the iPhone developers can get some more money and add in-game expansions down the line. 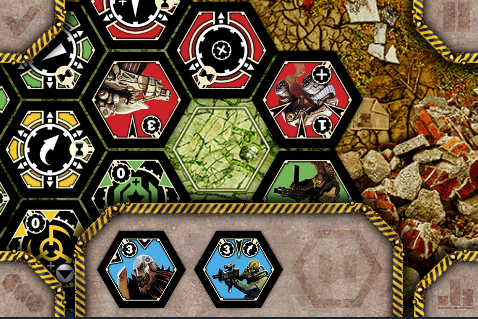 My only complaint as a beginning player is that some of the icons aren’t easily intuitive and I had to go back to the unit descriptions to figure out some of the tiles. I know that I am just beginning to scratch the surface of how to play the game well, especially moving the units and using the special building. I have beaten the game’s AI on easy twice, so that’s good. One other interesting mechanic, after drawing up to three tiles for your turn (which the others can see), you have to discard one tile every turn. So, you’re forced to chuck about a third of your force in a game. The game ends either when you’re the last headquarters standing or one player is out of tiles and everyone else gets one more turn. The player with the strongest headquarters win. The battles are where the program shines as it looks like slogging through the process in a board game would just be time consuming and boring. Once again, an hour-plus game can be played in fifteen minutes. This really isn’t an in-depth review, just a heads-up for iPhone users that there’s a new board game to support. Check it out. I’m not a big fan of the original Settlers of Catan. There’s too much luck and I’m not a trader. It seems longish as well. However, the bits are nice and it’s often cited as the number on gateway game. 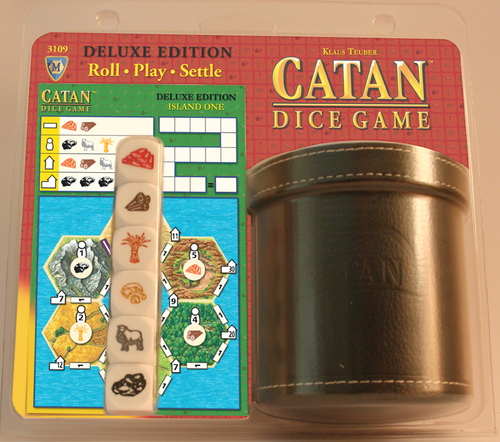 People who don’t play a lot of nerdier board games will play Settlers of Catan. Well, The Settlers of Catan Dice Game takes all the elements of the original Settlers that people liked and chucks them out the window. It’s a dirt simple press your luck dice game. There’s zero interaction and a lot of dice rolling. The game also features my least favorite game bit, the score sheet. Each player has to have one to play. Since there’s no limit to how many people can play because you’re playing against yourself with no interaction, you could have two 50 player games and be out of score sheets. Actually, the dice game can be played as one of two different games (each side of the score sheet). We only played the first simpler game. In this game, you call roll the dice up to 3 times to get enough of the resources you need to build a road, village, city or night. You score points when you get these different goals. As you build roads, you color in the roads and move toward the villages. After fifteen rounds, you total up each round score and declare a winner. There’s no way to affect another’s score in any way. So, it’s just a bunch of people chucking dice for an hour. Oh yea, the printed time said 15 minutes to play, but it took the four of us an hour. So, why did Shells even get the game? Did’ja see the sweet dice cup in the picture? That’s why. I wonder if in countries where haggling is prevalent, are card games like Bohnanza popular? Is there an Afghan version of Settlers of Catan? I don’t know and furthermore am I being racist? I hope they play a lot of weird German card games in the barter countries, you know, to increase the peace. 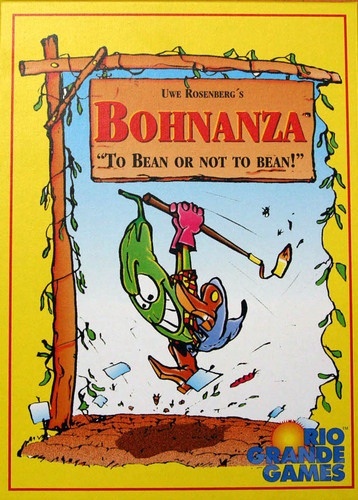 Bohnanza is a light card game where you trade, plant and harvest different types of beans for victory points. First off, beans? This isn’t a game where the mechanic is heavily intertwined with the theme, so the collecting and planting and harvesting could be anything, Martians planting humans, cars in a garage collection, guitars, baseball cards, heck, even regular old crops would be less boring than beans. The only people to get excited about beans are the starving and old hippies. (Wow, who knew a review about a bean card game could be so offensive, it’s a gift/curse.) I’ve heard many nice things about Bohnanza through the years, but the picture of a bean on the cover has kept me from buying and playing it. I played it yesterday with James who bought the game at Goodwill still IN THE SHRINK WRAP. So, I’m imagining I’m not the only one unexcited about a bean game. There aren’t even any bean counters included to get some milage out of an old pun. And you can use counters. More about the game. When you get cards, you can’t rearrange them in your hand which is a unique mechanic. At the beginning of your turn, you must plant the front card in your hand in one of your two fields (later, you can buy a third). There are different types of beans to plant each of different amounts in the common draw deck. You can only plant one type of bean per field and you must harvest a certain amount of beans, different for each type, to clear the field. You also draw cards at the end of your turn which file in line at the end of your hand. So, the game comes down to hand management. And to get the order of beans in your hand the way you want to plant, you have to trade out the beans with other players. This means haggling. And bargaining. And pleading. And shmoozing. And threatening. Feelings may be hurt. Over a stupid bean game. I’m not a fan of trading games because they sometimes devolve into an emotional game. If you play with two or more siblings or the child from a large family, the issue of ‘fairness’ always comes up. They say that a good trade is one where each side comes away feeling they’ve bested the other. In this game, you could use math to figure out who is the winner in each trade. That’s not a fun thing to do in this game. But the emotional and situational nature of trading certainly change the nature of what’s fair. In fact, you can just give your cards away to other players just to build trust. Boy, that makes the game even more psychological. I think I came in second in the one game I played because I decided, about a third of the game in, to trade with only those I thought were going to win. That strategy worked pretty well for a game I didn’t really grasp the nature of play until about a third of the way in. You know, I don’t mind ‘Screw your neighbor’ games like Munchkin because you’re expected to go after the leader, but in trading games, it’s frustrating and infuriating to trade because I don’t know if I’m helping someone else more than I’m helping myself. I rarely trade in Settlers of Catan because I feel like I can win without trading. It rarely happens, but in Bohnanza, you HAVE to trade. This does make the game more social which is a good thing. We played Werewolf, the ultimate social game, again yesterday and every time I’ve played a werewolf-type game, there’s been zero social interaction. Maybe social interaction in a game is more dependent on naked self-interest, than just tearing down others. It’s a thought. Overall, Bohnanza is a simple enough game for game newbies. There’s some interesting mechanics, lots of trading and play in under an hour. I’ll play again, but maybe I’ll need more social lubricant for trading purposes. Shortly after starting this review blog, I realized I wasn’t really writing reviews to crank out reviews for the non-masses. That’s a bit unselfish a thing to be doing for free. To keep this blog up, I plan to write mostly about ideas that interest me. I’m a pop culture baby. A life of television, movies, games, books and music infects how I see the world, process it and deal with it. Celebrities regularly show up in my dreams and help me fight the zombies within. Maybe that’s shallow, but it’s the ideas behind all the pop consumption that interest me. I’m babbling. I hope to evolve these reviews into some kind of Frankenstein combo of essay, personal diary and review. 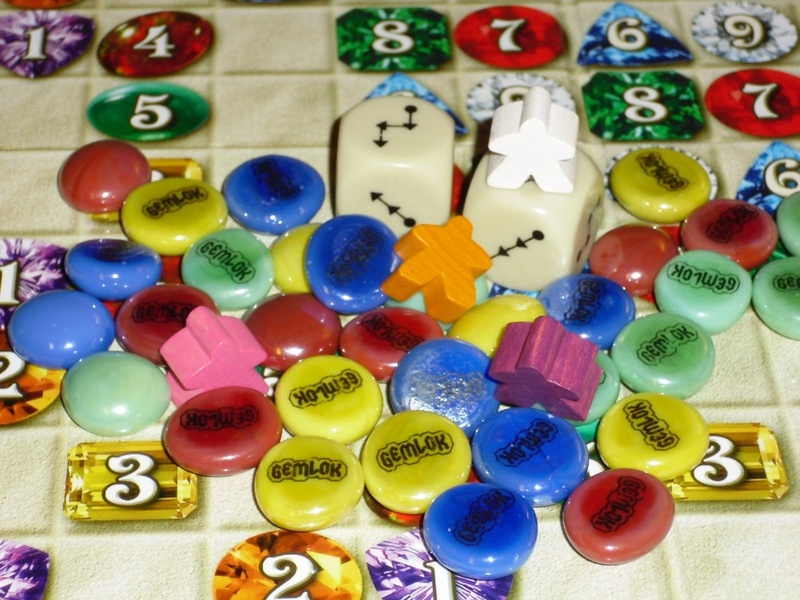 Gemlok is billed as a Mensa-level strategy game on par with chess and other ancient brain scratchers. That’s according to the label and probably the reason I burned off another Barnes & Noble coupon. I’m not so sure about Mensa-level. Of course, my GFF has already beat me to the punch and posted a REVIEW. Go read it. Why are you waiting? What are you? Dumb? Go read the review now. Shells even took the picture you see above. She also has a new avatar. It’s below. Just subscribe to her blog. She knows her stuff. Read her reviews. Love her, just not as much as I do. Unless you’re her children or parents or brother. But love her in a different way, you know. Good bits, lousy board, interesting move mechanic, too much luck masquerading as strategy, simple clean play, and it’ll play different with four people than two. Once again, NOW. Shell’s reviews are way better than mine. I hope Shells uses the previous sentence as a pull-quote in her press material. I don’t really mean it, of course, well, except for this review of Gemlok. This review blows. Like hard.